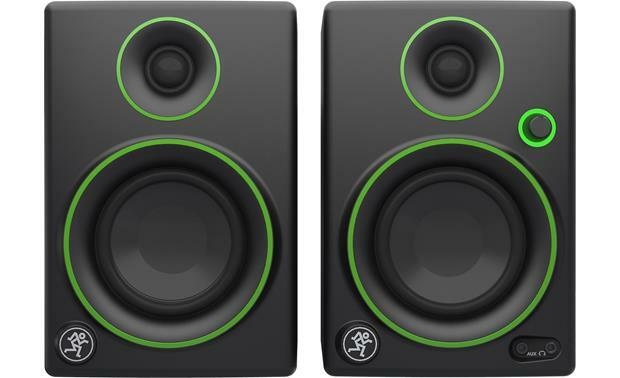 These pint-sized monitors deliver rich, powerful sound. These pint-sized monitors deliver rich, powerful sound thanks to a combination of premium quality components and solid, all-wood cabinets. 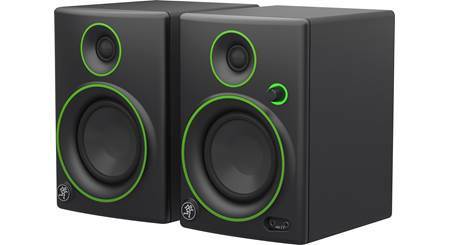 Each boasts a rugged, poly-coated woofer enhanced by a custom-tuned, rear ported enclosure for smooth, even bass extension. Their 3/4" silk dome tweeters feature a smooth waveguide design for improved sound dispersion and stereo imaging. 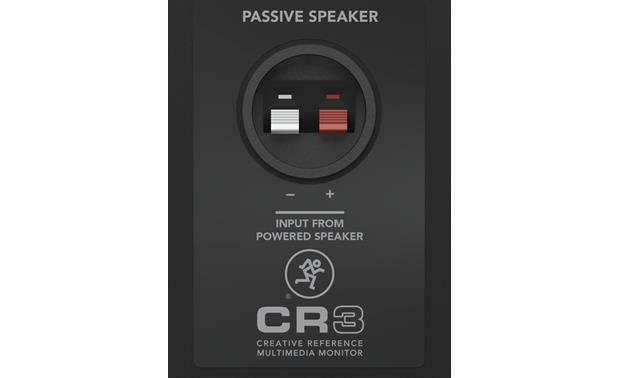 Whether you're creating your next album or simply enjoying your tunes and videos, the CR3 monitors will deliver the goods. 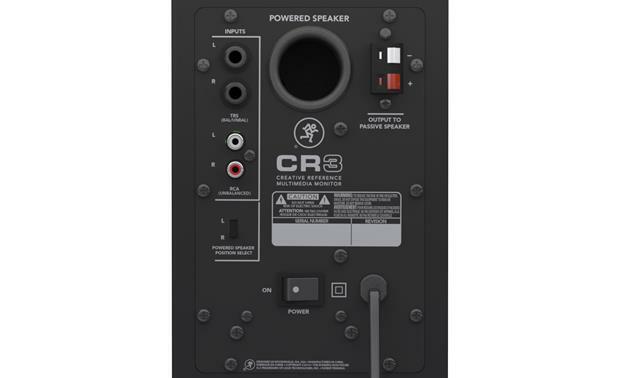 The CR3's amplification, connections and controls are all found on the powered monitor, which connects to the passive monitor using the supplied 6' speaker wire. 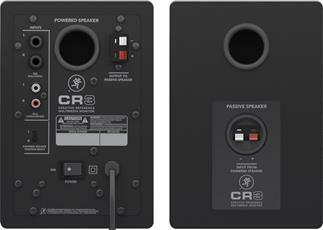 Setting up your CR3 monitors is easy. The speaker's left/right selector switch lets you choose which side of your work station gets the volume knob, headphone output and auxiliary input jacks. (Thanks Mackie, a lot of us really do have a preference!) Your choice of balanced 1/4" TRS or unbalanced RCA rear-panel inputs are ready to handle line-level monitor signals from your PC or mixer. 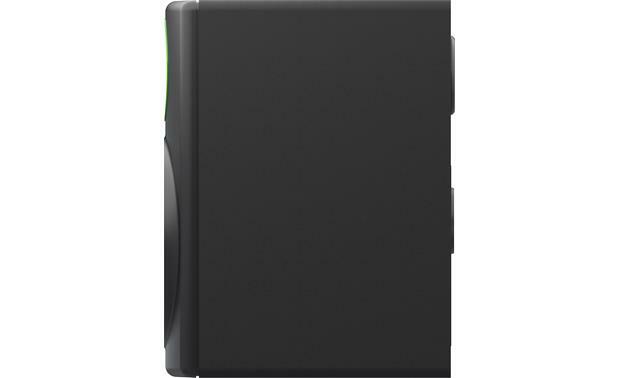 The front-panel volume knob makes setting volume levels a snap, and allows you to turn the monitors on and off. An illuminated ring around the volume knob lets you know when the monitors are powered up and ready to play. They sound great to me. They were easy to hook-up and are not too large for the space I allowed for. Does it come with the powered speaker as well as the passive speaker or just the powered one? 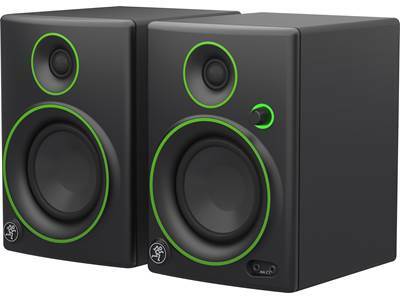 Two-Way Speaker Design: Each Mackie CR4 multimedia monitor speaker features a two-way driver design with one 0.75" ferrofluid-cooled, silk-dome tweeter and one 3" polypropylene-coated woofer with rubber sound. This combination of premium drivers provides a rich and natural studio-quality sound. Built-in Amplifier: All drivers are powered by a built-in 28W RMS/50W Peak Class AB amplifier which provides clean, articulate stereo sound and an ultra-wide frequency response of 80Hz to 20,000Hz. 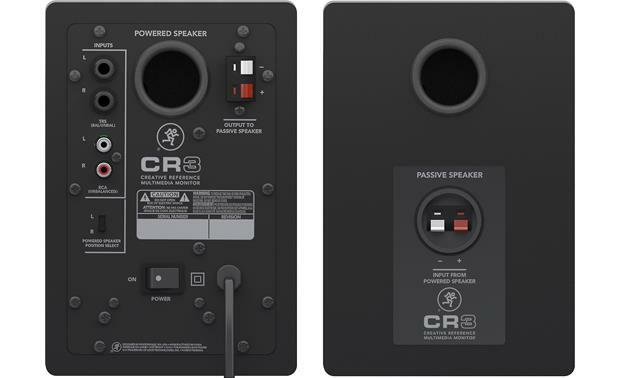 Speaker Cable: Because the amplifier is built into only one of the CR4 multimedia monitor speakers, you'll need to connected the included 6.5' speaker cable between the two loudspeakers rear-panel spring-clip terminals. 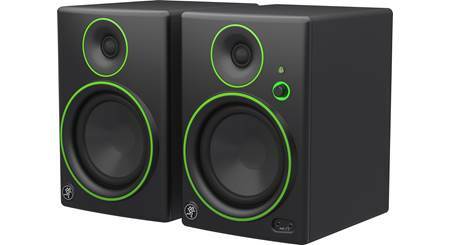 Are the Mackie cr3"s good for mixing? I'm not sure about that since I use mine for computer speakers but I don't see why they wouldn't be. But if you EQ them they sound very good. If you play them flat, they sound pretty dull. I was disappointed at first but now that I have them dialed in to my liking, they are very accurate, have tons of power and good, detailed bass response for speakers this small. For the price, you can't beat them. Yes they are but I moved up to 5 eventually. Don't get them. Very cheaply made. Mine stopped working just shy of two years. After doing some further digging, I found my problem to be EXTREMELY common. 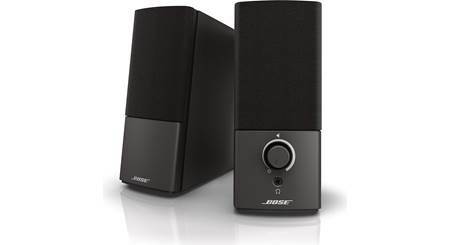 will these speakers work with a bose lifestyle 5 music system ? Can these be hooked to a turntable? Will this work with an Echo Dot as an external speaker system? Well,they aren't bluetooth speakers, and echo dot is a blue-tooth system. If you're using a device with bluetooth connected to the c3's, and said device is connected via BT to your echo dot, then I suppose that would work. But that's probably not what you want. If there's a way to connect via aux-cord port, that would work too I suppose. It's the set of both speakers. 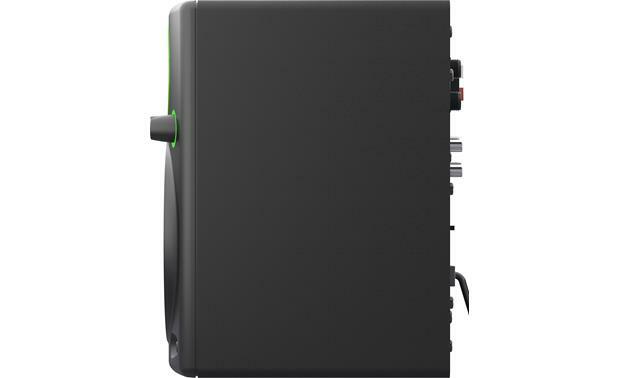 One of the speakers houses the amplifier for both speakers as well as the input jacks, headphone jack, power switch and volume control. It's a simple setup; just connect both speakers together with the included cable. You can actually choose whether the powered speaker outputs the left or the right audio channel, so you can adjust it to whatever is more convenient for your setup. It comes with both. The one speaker with amp powers the other one. All the cables come in the box as well. It comes with both and the wire plus foam paps to set the speakers on that angles them up. You get two speakers. One powered the other passive. I really like mine. Are there grills to cover the speakers, or are the cones exposed and the green outlines visible (as pictured)? Thanks. The speaker cones are exposed and the green outlines are displayed just like the picture. No, there are no grills. The cones are exposed, although they are recessed about 3/4 inch from the front surface. Green outlines look just like they do in the picture. So, I suppose you would have to be careful not to poke the cones with a sharp object. That hasn't bothered me yet! The sound coming from my computer now is really nice. The cones are exposed, the outlines are definitely visible just as pictured. The outlines are a painted piece of decorative trim & aren't removable to my knowledge. If it means anything, their a great set of speakers that exceeded my expectations. No grills on these. Great sound quality for the size. The woofer is very durable although the cover for the tweeter is paper thin. Not recommended if you have kids near them. 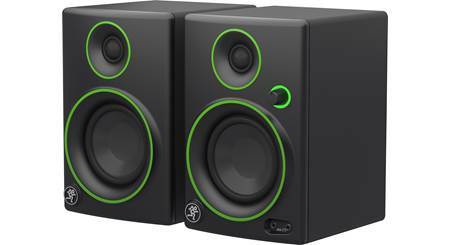 I have them paired with a Polk Audio 150 watt 12" Subwoofer and I am very impressed. As pictured, nothing covering the speaker cones. 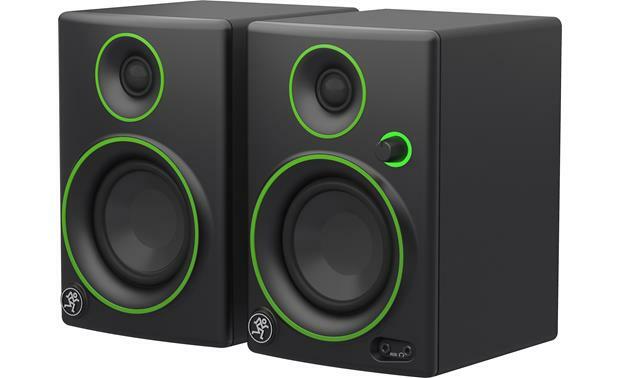 Searches related to the Mackie CR3™ Creative Reference™ Multimedia Monitors 2-way powered studio monitors with 3" woofer and 3/4" tweeter.